Registration for the 2019 Workshop is now OPEN! To register for the 2019 Workshop, click on the Registration Forms tab on the menu in the column on the left. INTRODUCTION TO ENSEMBLE PLAYING for VIOLINISTS who have completed “I Can Read Music, Vol. 1” or equivalent and able to read notes on all four strings. Go to Workshop Ensembles tab for more information. ADVANCED ENSEMBLE for violin students who have polished and are performing Humoresque Book 3 and above, cello students at Two Grenadiers, Book 2 and above and viola students at Gavotte by Lully, Book 2 and above. Go to Workshop Ensembles tab for more information. VIOLA ENSEMBLE for viola students who have polished and are performing music in Suzuki Viola School Book 2 and above. Go to Workshop Ensembles tab for more information. Friday night features Lessons with Master Teachers, Advanced Ensemble, Introduction to Ensemble Playing for Violinists, Viola Ensemble, Cello Choir and Fiddling. Start the day on Saturday with a BANG and get the full Workshop experience with high energy Play-Ins led by Terry Durbin and Rodney Farrar. Violin Play-In will be in the GHS Auditorium at 8:00 AM. Cello & Viola Play-In will be in the GHS Band Hall at 8:00 AM. Early Registration Payment Deadline is December 14, 2018. To be processed as Early Registration, the $70 payment must be received by December 14. If payment is received after December 14, the full registration fee of $80 is due. Regular Registration and Payment Deadline, January 11, 2019. After January 11, registration is not guaranteed. We will honor as many late registrants as possible. A late fee will be applied after January 11. Registration fees are non-refundable after January 11, 2019. Registration is not complete until all Forms and Registration Fees are received by Greenville Suzuki Workshop. A student will not be scheduled for classes until registration is complete and payment is received. Late registrants will be scheduled if space is available. 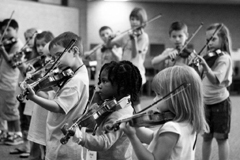 The Greenville Suzuki Strings program owes its existence to the support of our community. It’s not common to find a program such as ours in any public school system, let alone in a relatively small town. However, it’s not surprising given Greenville’s history of music advocacy and appreciation. The champions in implementing this program, the Greenville Suzuki Strings Association (GSSA) and the Greenville Independent School District (GISD), are prime examples. The GSSA and GISD join other non-profit organizations whose purpose is to enrich our lives through music. The Dallas Symphony Orchestra in Greenville Series, Kenneth Threadgill Concert Series, Bob Wills Fiddle Festival and Contest, and Greenville Entertainment Series all bring live music to our community throughout the year. All of these organizations rely on the patronage of our neighbors and community businesses. Here you can explore things to do in Greenville as well as history, places to dine, hotels, attractions, annual events, and much more. Best Western Plus Monica Royale is the Host Hotel for the 2019 Greenville Suzuki Workshop.